The National Lotteries Authority North East League began last Sunday afternoon at the Chili Playing Field. This poor turnout evoked comments from Chairman of the North East Football League Trevor Huggins and Minister of National Mobilisation, Youth, Sports etc. Hon. Frederick Stephenson. Huggins revealed that come 2012, the league will kick off with an innovative competition, in which all of the participating teams must be present. Stephenson was the more forceful, as not only did he chide those teams which were absent, but he also lashed out at those who were tardy, arriving almost an hour after the scheduled 3 pm start. A visibly upset Stephenson said the actions of the guilty parties were disrespectful and unacceptable. The opening ceremony was also addressed by General Secretary of the SVGFF Ian Hypolite, who urged the Parliamentary Representative of North Windward, Montgomery Daniel, to use his office to acquire a pair of goal posts for the London Playing Field. Hypoliteâs call was in light of the fact that Carib Warriors, which is from the Sandy Bay area, will be participating in the Premier Division of the 2011-2012 National Lotteries Authority National Club Championships. Daniel, who stood in for Prime Minister Ralph Gonsalves, used the occasion to laud the achievements of his constituents in both sports and culture. Daniel promised to take the concerns expressed to the relevant authorities. 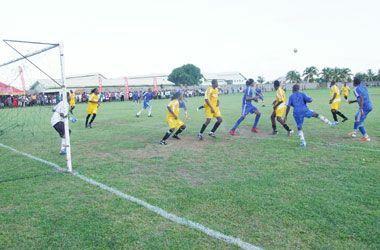 This year marks the second year of delight for the North East Football League organizers, players and spectators, who have the benefit of a fully grassed playing surface and enclosed facility. Huggins spelt out the benefits of the fenced facility, stating that as a result of a regular collection at the gates during last yearâs competition, his organization was able to assist footballers and others with their medical expenses. The Chili Playing Field was one of the sporting facilities which benefitted from enhancement from the Social Investment Fund projects. Following the ceremony and March Past, there was the feature match between the 2010 North East champions, as well as the 2009-2010 National Lotteries Authority National Club Championships First Division winners, Carib Warriors and Brownstown United, losing finalist, National Lotteries Authority National Club Championships FF Knock Out Cup. The rivalry between the two will go on for at least another year, as they played to a 1-1 draw in regulation time. Playing for the opening shield, the match went into penalty kicks, and they were locked 4-4 in the shootout when bad light forced the discontinuation of the kicks from the spot. Both were in the finals of last yearâs North East League, with Carib Warriors coming out victors on penalty kicks. Eighteen teams are listed to compete in the Senior Division of the 2011 competition, with six registered in the Under-17 Division.